The SPC oversees the implementation of the Society’s science policy agenda, as set by the Governing Board. The committee works closely with staff as well as ESA’s contracted government advocacy firm in Washington D.C. The committee, which includes a representative from each Section and Branch, oversees and administers the Science Policy Fellows program, the drafting of all position statements, and the EPA Liaison. If you would like to be considered when a vacancy occurs on the committee, please contact your Section or Branch leadership. When the Governing Board determines a need to draft a position statement on a topic, a writing committee will be created to draft the statement, using member input, expert knowledge, and a thorough review of the issues to be covered by the statement. When committees are in the process of forming they will be announced in the Science Policy Newsletter as well as in eNews. Please watch for announcements if you would like to be considered for a spot on a writing committee. Click here to see the current position statements of ESA and click here to view any open writing committees. 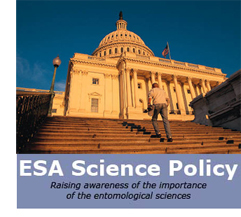 One of the most visible volunteer positions in the Society, the SP Fellows – both past and present – become the first “go to” resources for ESA when crafting the Society’s science policy materials, from position statement writing committees to tapping individuals to advocate on behalf of the entomological sciences. Application is conducted annually in tandem with the call for Awards nominations. Please click here to learn more about the program and apply.